Freelance writing clients can be tricky sometimes! 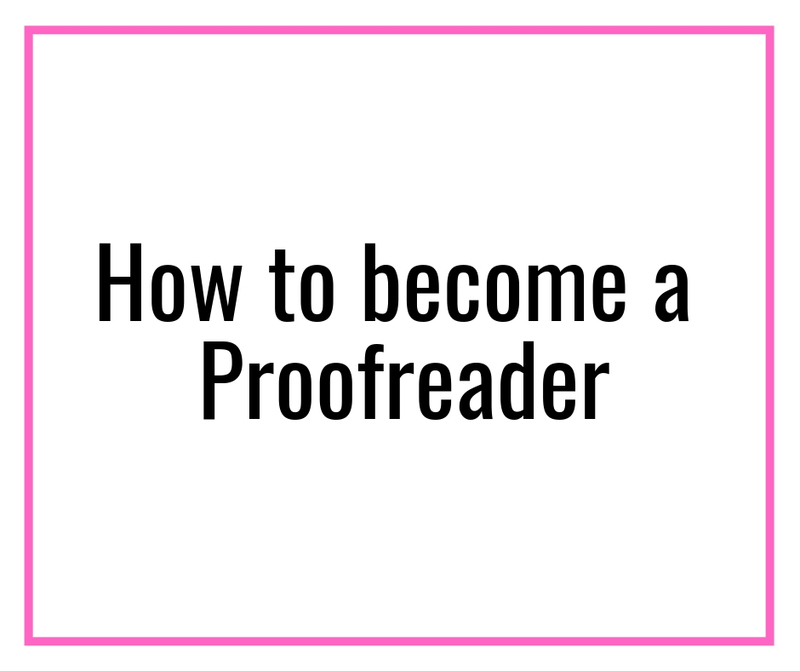 I have been writing professionally for over a year now and have come across thousands of clients who have asked me to write a sample for FREE if I wanted to land that freelance writing job. In my opinion, it is ok to consider it. Hey, before you shoot any question or badmouth me for asking you to work for free, just listen up. Some freelance writing clients want to “test your knowledge” in that specific area, some have “company policies” to not hire anyone until you write a sample. Truthfully, most of them are trying to exploit you or get free content written by multiple freelance writers in the same manner. While I advise you to politely decline these generous offers, there are a few you should be willing to consider. I won’t lie to you! When I began as a freelance writer, I wrote FREE SAMPLES. But, not for everyone. 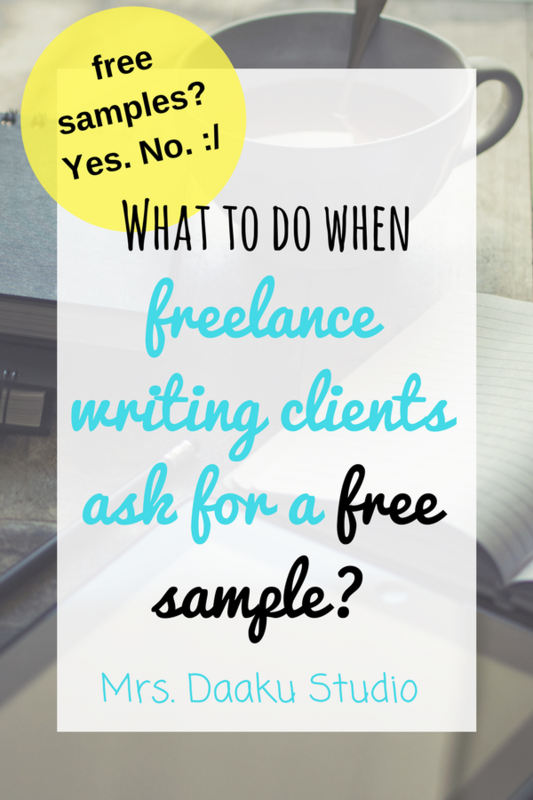 So, how do you decide what to do when freelance writing clients ask you for a test gig? I am in favor of literally “building a portfolio” if you don’t have live samples. Meaning, take a few trending topics (at least 2-3), write content and showcase them as your sample. But, meanwhile, you should be open to testing trials and gigs. Just be damn careful of FAKE freelance writing clients and falling into a trap without having ANY gains for yourself. How would you know if that freelance writing client is trying to exploit you? 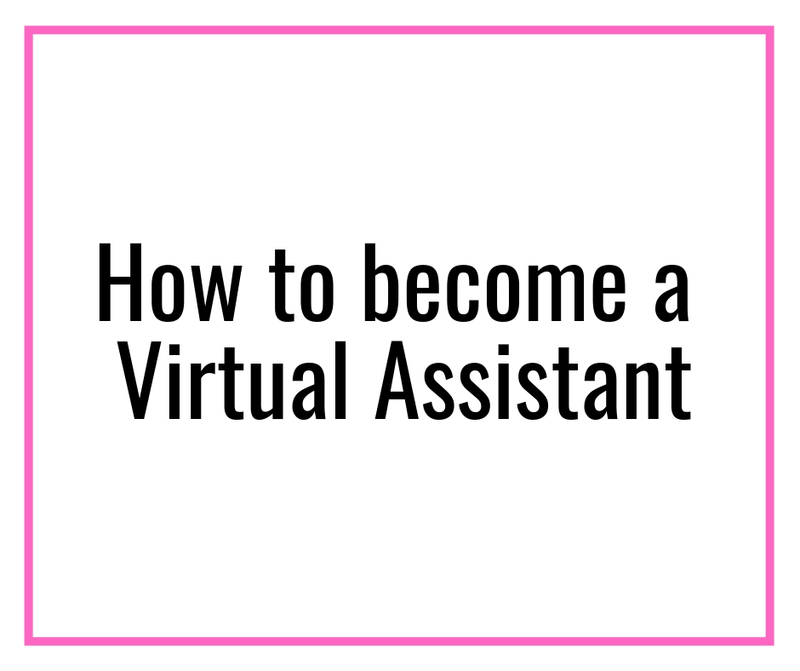 Start with an online search on them: You are looking for an online presence – anywhere on Google or social media platforms like Facebook or LinkedIn. If you hit a dead end or having a great difficulty in finding any freaking information about them, it is best to let go off the freelance writing job. Are they rushing you into free samples before discussing rates? RED FLAG. Think about it – how can sensible freelance writing clients ask you to write an article and not care about the budget. Right? So, this is another NO. If you have relevant samples for the clients, I see absolutely NO point in writing a test gig for the freelance writing job. They can judge your tone, style, and quality of the work you submitted. Ask them politely to go over your samples and judge the quality. 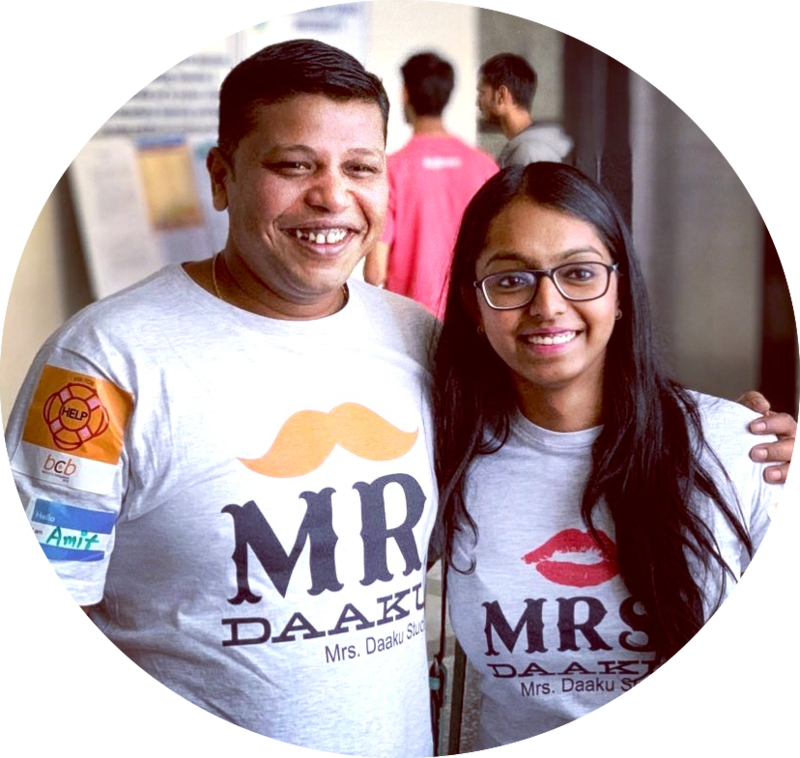 Get on a call with them and explain why you aren’t ready to write a free sample for them. Most of the times, you can understand from the conversation whether it is a NO go or a “let’s think about it” gig. Start your conversation with the first option. In this phone call, you will realize whether the freelance writing client is really worth your time. Most of the times, you will know they are FAKE and want to exploit you. If you don’t want to get on a call, ask them to pay you for the trial. A lot of businesses will agree to it. It is the best way to find if you are the right fit for one another with no strings attached. They don’t like your work, they don’t HAVE to work with you. You don’t like working with them, you CAN move on easily. Let me tell you, a lot of good clients ask for test trials but they also pay for it. They are not FREELOADERS! 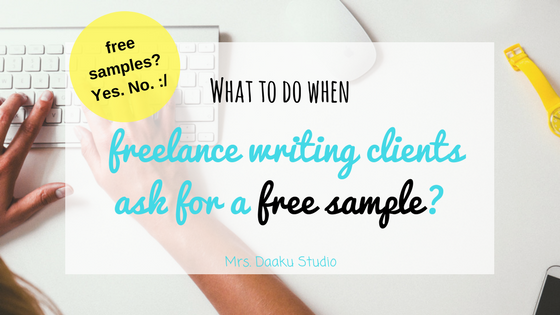 So, don’t reject a freelance writing job because a client asked you to write a free sample. 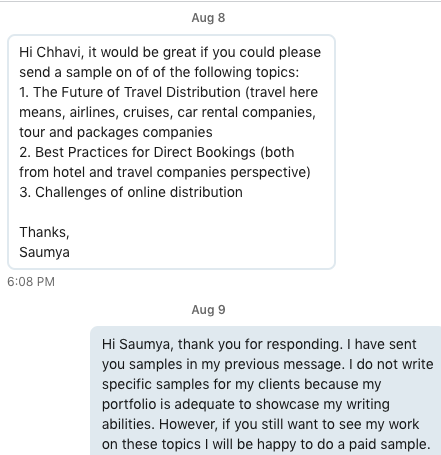 This is an example of freelance writing clients asking for a sample from our second month of freelancing. We had no relevant samples for him but when we got on a call, we decided it will be a paid sample. The client had outlined exactly what he wanted to see in the content. We found a strong online presence and he did not raise any red flags on the call. So, we went ahead with this freelance writing job. This eventually did not work out, but the test gigs were worth the time. Last but not the least, sending them the one-page document will settle everything. If they are looking for free content, they either won’t respond or not sign the document. Either way, you decline the freelance writing job and move on. In case, they sign it, you are safe. 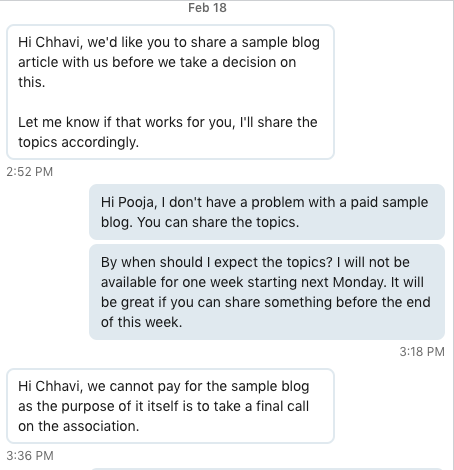 Remember – if you already have relevant samples, DO NOT BOTHER WITH THIS! Is the opportunity too big to pass? Most of the times they will use your sample content (if it is good). Meaning, they will need to pay you to use it. Remember the one line document we signed? If they don’t select you (and they liked the content), why not go ahead and ask them to publish it in your name? Make it a guest contribution and earn a live link for your portfolio. Win-Win. In either case, you can ask for a testimonial for your work. Once you submit the test article, use Google Alerts or Copyscape to see if your content is not published without your permission. Also, if your client doesn’t respond, send a reminder first. If they still don’t, remind them that they cannot use your content. If you are struggling to find good clients who pay well and not ask for free samples all the time, you may want to try these 10 legit places I talk about. Do you still have questions? Over to you – shoot them in the comment and I will answer them.